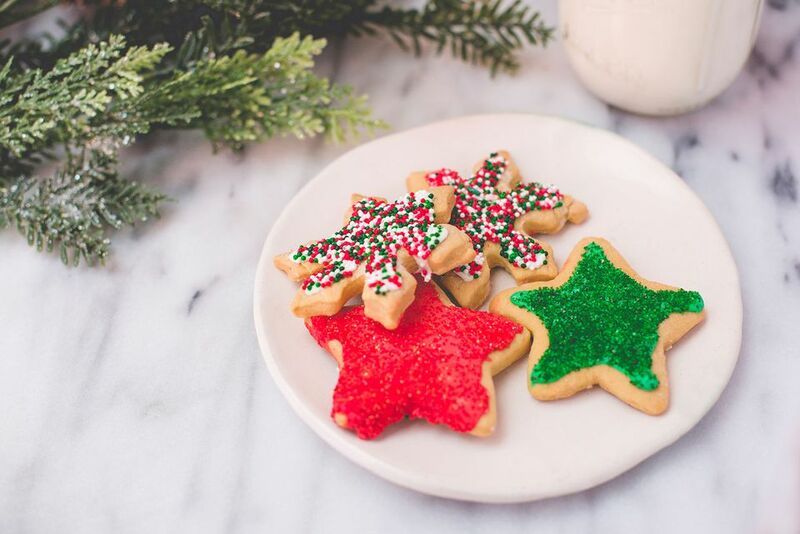 With almost half the butter of most sugar cookies, you can treat yourself to one of these low-fat holiday cookies without feeling too guilty. Top with sprinkles before baking or add a glaze afterward using confectioners' sugar, lemon juice, and some food coloring. Using a mixer, beat butter and sugar until creamy. Add egg and vanilla, mixing well. In another bowl, whisk together flour, baking powder, and salt. Gradually stir flour mixture into butter and sugar until dough forms. Don't worry if the dough seems a little crumbly at first; it will come together. Wrap dough in plastic and chill for two hours in the refrigerator. Heat the oven to 350 F. On a lightly floured surface, roll out dough to a 1/4-inch or 1/8-inch thickness. Use holiday cookie cutters dipped in flour to make cutouts. Gather scraps and re-roll until all the dough is used. Place cookies 1 inch apart on a parchment-lined cookie sheet. Bake for 9 to 10 minutes or until the edges are lightly browned. Wait 1 minute and then transfer cookies to a wire rack to cool completely. Store tightly covered for up to two weeks. These cookie recipes are ideal for the holidays or for year-round enjoyment. Just because you choose to eat low fat, you don't have to give up all the pleasures of eating in life. Judge for yourself. Fat-free brown-sugar-meringue cookies are completely fat-free and baking them at a low temperature dries the meringues slowly to make the outside crunchy. They melt in the mouth. Low-fat double chocolate-chip cookies are the answers to a chocoholic's prayers. By using half the amount of butter called for in traditional recipes and substituting an egg white for a whole egg, the fat content in this cookie is cut nearly in half. As long as we're talking chocolate, these low-fat brownies are definitely worth a look-see. While not as dense as their full-fat cousins, they're still chocolatey good with no odd aftertaste, which some low-fat brownies seem to have. If you're on the low-fat train and a vegan, too, this vegan pumpkin cookie will fill the bill. Applesauce takes the place of margarine or oil and they are made dairy-free as well.